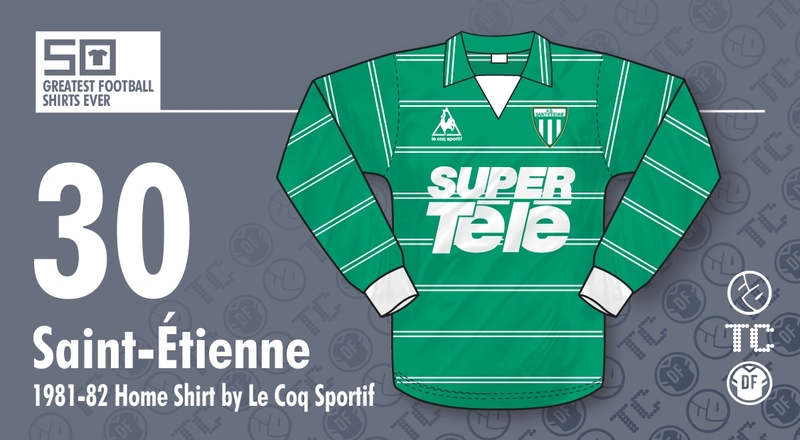 The iconic French side Saint-Etienne (pronounced ‘center gen’ as we are reliably informed by our resident Frenchman, Jay) have had so many sublime kits over the years its difficult to pinpoint just one to be elevated to greatness. 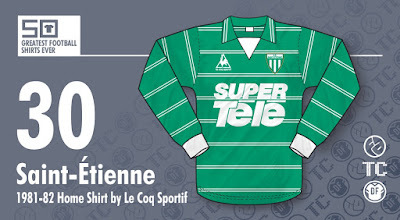 The 70's classic with tricolore trim is just one example of how ‘Les Verts’ dominated French football fashion at the time. But for me the 1980-84 Le Coq Sportif long-sleeved home shirt is truly an item of apparel to be marvelled at. It's a jersey that is as confident, bold and stylish as the team that wore it (which of course included a young Michel Platini who helped the side clinch the 1980-81 Ligue 1 crown). You may remember the French 1980-84 adidas home shirt that made it into our countdown last week? This shirt is a close relative and features a similar collar/white insert panel combo; the white insert standing out like a beacon amidst a field of green. This shirt also features pinstripes, but in a sartorial statement that took us in England a good couple of years to catch up on, they were placed horizontally! And in pairs! And they continued on the collar! Incroyable! As if that wasn't good enough the logo of club sponsors ‘Super Tele’ (a French pop/TV magazine) is frankly enormous and plastered over the shirt in an example of blatant and arrogant commercialism. To some it may be ugly, to me, its beautiful! France embraced the common sense of sponsorship early on and in fact, all French sponsors’ logos at the time were huge including that of KB Jardin who took over the shirt deal from Super Tele in 1981 and continued on this jersey until it was mothballed at the end of the 1983-84 season. From a retro perspective there’s something about a massive ‘in your face’ sponsors logo that is inherently cool - and the fact that in this instance it's on arguably the coolest shirt of the coolest team in France is perfectly fitting.